Embrace uncertainty – Anyone who doesn’t follow this momentous maxim in coming years is likely to get one unpleasant shock after the next. Because the stable progression of the world economy since WWII is now coming to an end. 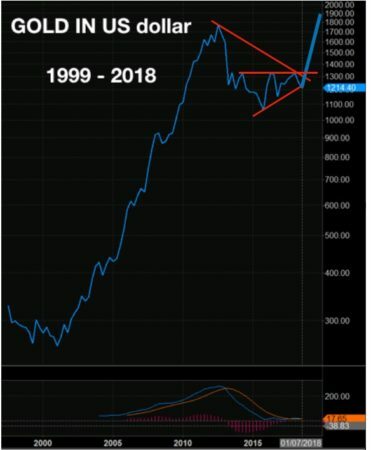 What should have been a normal cyclical high in the next year or two, is now going to be the most massive implosion of a bubble full of debts and inflated assets. The system has been “successfully” manipulated for decades by central banks, certain commercial banks, the BIS in Basel and the IMF for the benefit of a small elite. 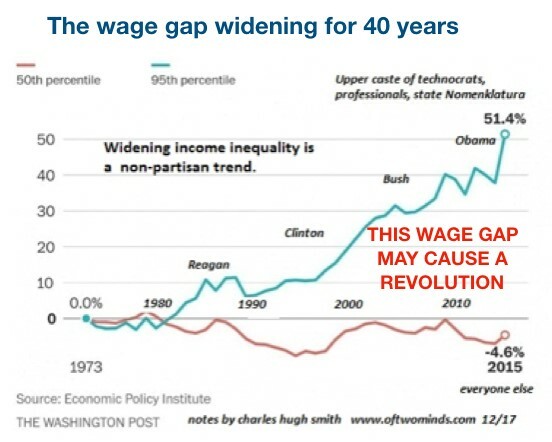 Just look at the chart of the growing wage gap in the US between the top 5% and the middle 50% since 1973. The top group has had a 51% increase whilst the middle one has had 4% decrease in wages. This is the stuff revolutions are made of and social unrest is clearly one of the uncertainties we must be prepared for. I learned early in life to embrace uncertainty because from this moment on in anybody’s life all is uncertain. Individual lives can change very quickly and and so can the world economy and the political situation. There are times when projections and probabilities work fairly well, but the next few years will be very different. Most investors believe that the historically predictable trajectory of stock markets will continue. And based on history why wouldn’t it, since the trend has been up for as long as anyone can remember. The corrections of 1973, 1987, 2000, 2007 are quickly forgotten as the market reaches new highs. The average investor always feels very confident at the top of the market. He doesn’t worry about risk and even if valuations are stretched, “the stock market always goes up”. Markets can easily become more overextended than anyone can imagine. And “it is always different today”. Investing is about risk and economic risk is today greater than anytime in history whether we look at stocks, bonds or property. But the uncertainty today stretches much further than various asset classes. It is much more serious than that because the actions of central banks and the fractional reserve banking system has created a monstrous financial system that has little chance of survival. What happened in 2007-9, when the banking system was hours from a total collapse, will soon come back with a vengeance. This time central banks will not just throw $10s of trillions at the problem. They will create, out of thin air, $100s of trillions and probably even quadrillions as the global derivative bubble bursts. This is clearly not the uncertainty that anyone could embrace. But like with many risks, it is fortunately possible to insure against the risk of a banking collapse, the crash of most asset classes and the final destruction of the currency system. Please reread the last sentence in bold. That statement sounds like hocus pocus and a fraudulent promise. How can anyone offer insurance against the whole $ quadrillion financial system? Like most elegant solutions, it is so simple that over 99% of investors as well as ordinary people would not even think about it. But what is even worse is that if they were told about the “life insurance” that could save them from destitution, they would still not consider it. This is exactly what has happened in Venezuela. A socialist regime has totally destroyed the economy and impoverished the people. If the people had bought this insurance 10 years ago or even at the end of 2017, that could have saved them. Please see my article last week. Most people will by now understand that I am talking about physical gold. It is such a simple and obvious solution to protect against the current risks but still less than 1% of people will consider it. Sometimes readers criticise us for our views on gold as if we were talking our own book. The reasons for being involved in the gold market have nothing to do with a vested interest. Back in 2001, I identified the risks in the financial system as being so elevated that insurance in the form of gold outside the banking system was a sine qua non. So early in 2002 we bought important amounts of gold for ourselves and the investors we advised at the time. The price was then $300. We advised our investors to hold an significant part of their financial assets in gold. We considered then that 25% was a minimum but that even higher percentages were advisable. 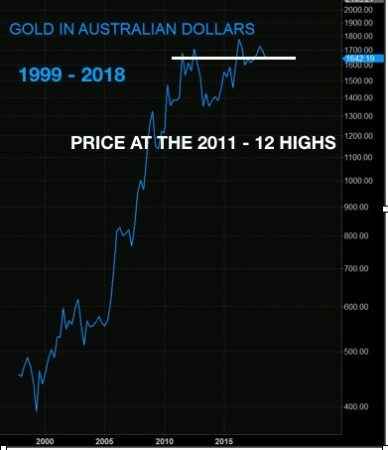 Gold rushed up to $1,900 in 2011 and has since been correcting for 7 years. In the meantime risk has grown exponentially and the reasons for holding gold as a wealth preservation asset are now stronger than ever. GOLD IS NEAR THE TOP IN MANY CURRENCIES. Looking at gold in other currencies like the Australian dollar the price is around the 2011-12 top. Also in Canadian dollars or Pounds, the correction from the top is much smaller than in US dollars. Gold in US dollars has only been weaker due to a temporarily stronger dollar. When the dollar starts its next leg to its intrinsic value of zero, gold will rise in all currencies including the US dollar. We must remind ourselves that the dollar, even at $1,220 gold price, has lost 80% of its value this century. Gold at $1,220, adjusted for real inflation, is almost as cheap as it was in 1999 at the $250 low. 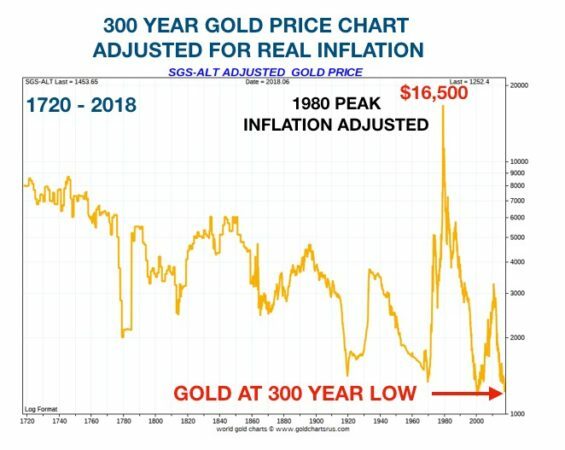 More importantly, inflation adjusted gold is now very near the 300 year low of 1999. So right now gold is again unloved and undervalued and therefore a bargain. On an inflation adjusted basis, the 1980 high of $850 would today be $16,650. Long before we get hyperinflationary gold prices, that $16,600 level should be easily reached. If you understand the 5,000 year significance of gold as the only surviving money in history, you should follow the example of the East.